Many people from all walks of life learn to fly every day. It is a very fun and challenging hobby, or can be made into a career! The EAA announced International Learn to Fly Day in 2009 with the aim of growing the pilot population and educating the public about the importance and value of the airports in their communities. Many people don’t know what it takes to earn their wings. For many, flying is only something one daydreams about, because it is such an unknown, and it is up to pilots to invite others ‘across the fence’ and show them what it is all about. Airports as well are great unknowns, but they serve us and our communities – they are ours to visit too! 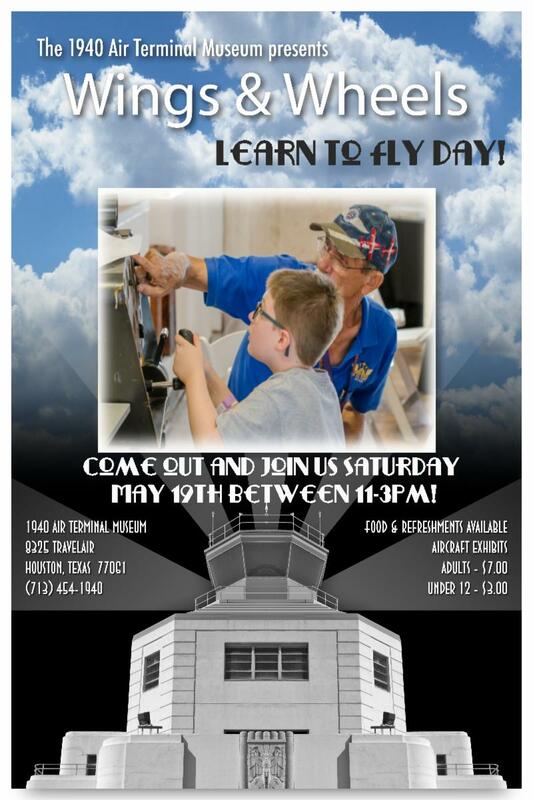 For Learn to Fly Day, we’re inviting area flight schools and flying clubs to visit the original terminal building at Hobby Airport and help us remove the mystery about becoming a pilot. And what better way to enjoy aviation than to spend your time volunteering at the Museum. We are always happy to welcome new volunteers to our crew so be sure and ask us how you can get involved. This month our Raffle Plane takes center stage! It’s Raffle Day! Join us as we draw the winner of the raffle plane. Buy a ticket today, and you could be the lucky winner! You can buy them right here on the website, or stop by, or call us. This is the tenth year we’ve given away an airplane! You could be our lucky winner!